It’s Grit, Gusto, Glory From the Moment GO! Often billed as NASCAR® on water, powerboat racing roars as one of the most explosive events on water. Sporting jet-engine speed and “no brake, non-shiftable, forward only” gears, the race at Regatta features the SST/120 F-2 class of boats capable of turning on a dime and dazzling spectators with their no fear agility and skill. Once the starting gun sounds, drivers rocket from the dock, climbing from 0-100/mph in less than four seconds. More impressive—they’ll reach four-plus G’s in the course turns barely slowing down, with the potential to top out at a dizzying 125+/mph on straightaways. 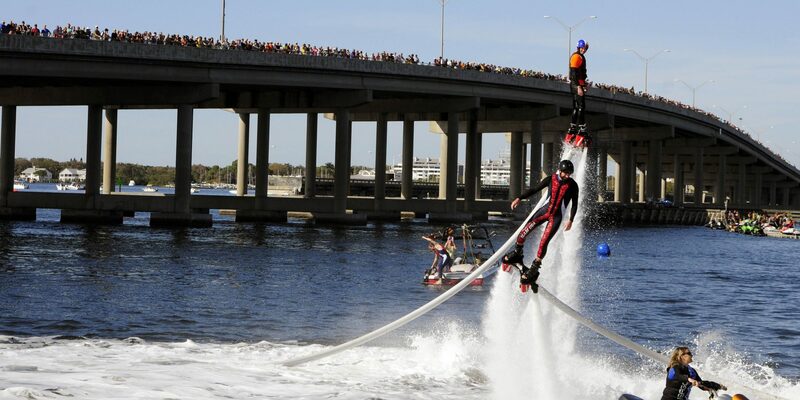 Bradenton-Palmetto provides the perfect backdrop for these sea-battling beasts as they circle the Manatee River in one heart-pounding, catch-me-if-you-can chase to the finish. Drivers from around the country, including Bradenton’s own, Jeff Reno, will once again descend on one of the most scenic venues on the circuit to engage, entertain and enthrall the crowds. The perfect place to watch? From high atop the mighty Green Bridge which, once again, will be closed completely across to offer a grand view of it all! MORE POWER…MORE ACTION…MORE RACING—Regatta has added a second classification to this year’s event…the Formula-3, SST/60 powerboats, which max out at speeds of roughly 100/mph, but are more nimble, definitely as loud and ferocious in their fight to the checkered flag as their F-2 counterparts. And you have a front seat to it all, in what has become the largest single-day racing event on the APBA circuit. With Spectator Viewing Directly From the Green Bridge! A booming, brilliant, bonanza of light. Since 1893, Zambelli Fireworks has mesmerized the faces of hundreds of thousands with its majestic displays of light, color, and pyrotechnic mastery. Considered the country’s First Family of Fireworks, the skies will glisten, glow and glare with their artistry in a dramatic and vividly gleaming presentation to close the days’ activities. The display’s magnanimous footprint showers the atmosphere with spell-binding illumination effects all musically choreographed to deliver one magical “surprise with every shell”…all of it an explosive testament to the fireworks flamboyance of Zambelli. Originally from Boston, MA, Kristen “The Destroyer” Smoyer performs stunning shows and has raised the talent bar for females to reach in flyboarding. Kristen is a certified Master Instructor for PWC Products–Zapata Racing and a proud member of Team Powerfly. Her hard work and determination have made her a role model for Hydro Flight sports from newcomers to pros. She’s been featured on news outlets across the country including: CBS Sports, Fox Sports, Sun Sports, H2RO Magazine, Sun Sentinel and Florida Today. From unbelievably long Frisbee catches and gravity-defying agility vaults, to jumping rope, hula-hooping, dancing and darting through an obstacle course, our expertly-trained border collies perform one of the leading dog shows in the country. Captivating performances and unique tricks go above-and-beyond with choreographed music, audience participation, photo opportunities, doggy meet-and-greets and more. People of all ages can’t help but love these amazing performance dogs! All shows demonstrate the incredible bond between animal and handler – all while providing an exciting experience for all guests. And as an added bonus, after each show, the audience can meet and interact with a few of these remarkable canine athletes. The dogs love to meet audience members of all ages and are great with kids and families. Lots of Kool Things for All the Kids! Regatta’s Family Fun Zones, in Bradenton and Palmetto, give tykes, teens and parents too…an all-day docket full of great giveaways and old-fashioned fun activities destined to dazzle their day. From games and inflatables…to interactive experiences with street teams from the University of South Florida and Tampa Bay Lightning…and don’t forget to check out the expo area with the US Army and The National Guard. With such an assortment, enjoying a great day of family fun and excitement has never been easier and more delightfully entertaining. The 30 piece USF “Horns Up” Ceremonial Band is a scaled down version of the university’s marching band and performs at USF events when it is not feasible to accommodate the full Band. See them at Regatta as they set up and sound off at the base of Green Bridge.